Therefore, let’s devote ourselves with renewed love to serve persons who are poor, and even to seek out those who are the poorest and most abandoned; let’s acknowledge before God that they are our lords and masters and that we are unworthy of rendering them our little services (CCD:XI:349). In these persons, Vincent saw individuals loved by God, created in God’s image and worthy of dignity and value. Vincent turned his frustration into a faith-filled desire to improve their lives. We pray that our God will give us the same courage and strength to change violence into love. In what ways do I extend mercy toward others as Saint Vincent encouraged? 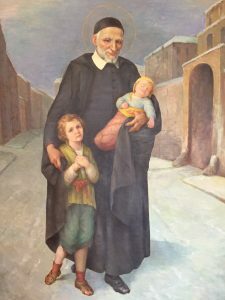 Saint Vincent de Paul, witness of the charity of Christ, give us the grace of loving God through the work of our hands. Help us abandon ourselves to God’s Providence, faithfully discovering God’s mercy in all the events of our lives. Grant us a tender heart filled with compassion for the distress and suffering of others, especially the most vulnerable in our world. Be with us in our service so that in our work, our families, our communities, our parishes, we become impassioned by God’s Gospel of love and mercy. “There is a great need now, as there was in Louise’s time, for Christians to live the Gospel with boundless charity. This is the challenge of Christianity in every age. We are called to be visible reminders of Louise’s great legacy, to continue to serve the poor, the sick, the illiterate, and the forgotten people in our midst. “This is our challenge today! “Like Louise, we experience a fractured world, a world of suffering, deceit, pessimism, injustice, and futility. Louise knew personal pain. “She welcomed the grace of God, which transformed her fretful heart into a courageous, generous, and compassionate heart that loved intensely; a heart that welcomed the poor, hopeless, alienated, and abandoned people. Louise offers us the courage to face ourselves squarely, to overcome our insecurities and our inadequacies, to band together with Christ, and bring healing and hope to our broken world”. How can I band together with Christ and bring healing and hope to our broken world? In 1809, Elizabeth founded the Sisters of Charity, the first American congregation of religious Sisters that focused on children, education and the poor. Keep well to what you believe to be the grace of the moment. You will so often be at a stand for what is best in a situation so new, but only do your best … and leave the rest to our dear God. 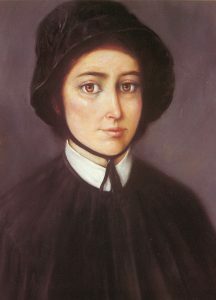 Elizabeth Ann Seton’s was canonized in 1975, a year celebrated as the International Year of Women. Today, our world still needs to be reminded of the unique contribution of women, to make space for this in every aspect of life, to blend both the feminine and masculine experience in truly mutual manner. Elizabeth gifted her time and ours with what has been termed feminine energy. Feminine energy is what we need to be saints. Feminine energy is powerful because it is pure presence – gentle yet firm. It is an energy that gives warmth, comfort and spirit simply by its presence. It receives rather than takes. It invites rather than demands. It unfolds rather than controls. Feminine energy shows her best face in leisure. She doesn’t take time. She has time. She has time to be. The world is starving for this energy. It is part of the fire Christ came to cast upon the earth – a slow flame that burns from within and gradually transforms what it touches, precisely because it touches rather than clutches. “We must be careful to meet our grace – wherever we go there is a store of grace waiting.” What grace is waiting for me today? 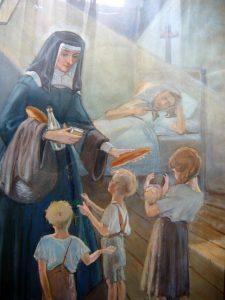 The Sisters of Charity, indeed the whole Vincentian family, are called to follow in Elizabeth’s footsteps, to serve those in need, with warm hospitality which welcomes all, especially the less fortunate. Who are in need of this healing touch of charity, in our world? How am I being called to share in this charism of charity?